The Immune Boosting Foods & Recipes™ e-book contains a full selection of recipes and foods specifically chosen for their immune support properties. 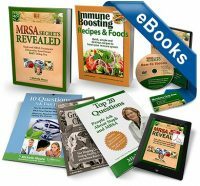 Discover specific foods and ingredients that strengthen your immune system and enhance your body’s self-healing ability. The recipe book includes 45 simple and delicious immune-supporting recipes for breakfast, lunch, dinner, desserts, snacks, sides and more. Save time, money and frustration at the grocery store with the grocery shopping checklist. Electronic download version for mobile or computer, NOT printed materials. 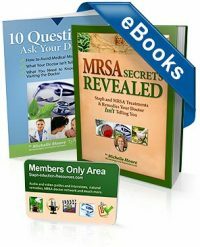 The body’s immune system is a key reason many people repeatedly struggle with MRSA and Staph. The foods you eat (and how you prepare them) have a big impact on your immune system and thus how well you resist and heal from infections. While some foods help support healing, others actually weaken your natural defenses and make it harder to get better. An immune support diet is the easiest, fastest and most economical way to guard against getting another infection. The key to eating an immune boosting diet is to eat more foods with the phytochemicals and nutrients your body needs to restore and maintain optimal health. Equally important is avoiding foods which harm your healing and invite reinfections. Save time, money and frustration at the grocery store with these convenient, printable and easy-to-use grocery shopping checklists. Take these checklists with you to the grocery store. Included are checklists for healthy food ingredients to look for and ingredients to avoid on food labels. There’s a checklist showing which fish contain mercury and other contaminants and which fish are safer for you. You’ll also see which foods are most important to buy organic and how to reduce your grocery bill without sacrificing quality. “I’m soooooo jacked about the information I have learned from you! “In my opinion, this is the only info available that really works. I suffered from many surgeries, high doses of antibiotics that I was allergic to, fevers constantly and lethargic states, it was a nightmare. You literally saved my life… Just boosting my immune system was the trick. Who would have thought it could be so easy? 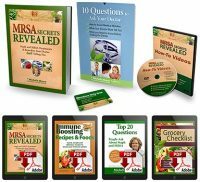 Get your copy of Immune Boosting Recipes & Foods, plus the free Grocery Checklist guide, 100% risk-free today. 76 pages, valued at $27.99. I am so confident that you will enjoy making and eating these recipes and experience more energy and better quality of life after using Immune Boosting Recipes & Foods, that I will give you four months to read and act on the contents of this e-book. If you are not absolutely satisfied with your program, just ask for a refund within 120 days and you’ll get a prompt and hassle-free refund. Is there a printed version available? 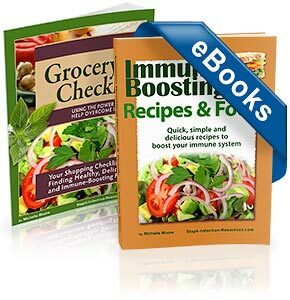 Immune Boosting Recipes and Foods is only available separately in an electronic, computer downloadable format. However, a printed version is available as part of the printed Advanced Recovery Program. What kinds of recipes are in this book? There are many selections to choose from for snacks, breakfast, lunch, soups and salads, entrees, desserts, smoothies, drinks and condiments. 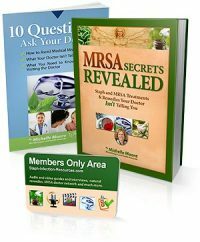 This is a very well rounded book to get you started down the road to healthy, tasty and infection-fighting foods. Is this one of those weird raw food, vegetarian books with foods that I wouldn’t eat? Michelle wrote this recipe book to match the varied interests of many people. If you are new to “healthier” eating, it has many wonderful recipes you’ll like such as Caribbean French Toast, Cuban Black Bean Soup, Herb Baked Salmon, and Brown Rice Pasta Alfredo. It also will help you as you grow into different types of foods with vegetarian and raw food recipes that are amazingly good and taste like you wouldn’t believe. I’m sensitive to gluten. Are there gluten-free recipes included? 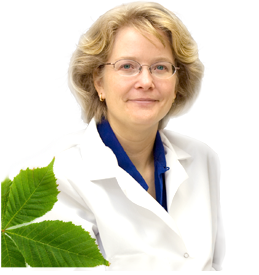 Food sensitivities can drain the body’s energy and immune function and promote infection. Michelle kept that in mind when writing this book. However, if you find a recipe contains a product containing gluten, it can easily be substituted for a gluten-free alternative.